On Wednesday, Los Angeles Laker guard Kobe Bryant plays his last game in the NBA after a storied 20-year career. In that time, he became a five-time NBA champion, a two-time NBA Finals MVP, an 18-time NBA All-Star (with four All-Star MVP trophies) and one of the few players who easily fit into any conversation about the best all-time players in the NBA. In a career filled with highlights (and some lowlights), it wasn’t easy picking just 10 of his best moments. 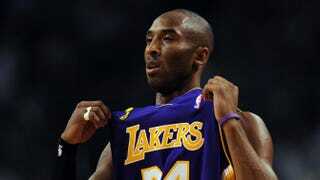 But we waded through the video to bring you what are arguably Bryant’s 10 greatest achievements on the court.